"An Overview of Illusions of Brightness"
The center of a flower appears to be bright. It appears as if intense morning sunlight were projected. These "light-shedding" effects are called "counterphase photopic phantoms" (Kitaoka, Gyoba and Sakurai, 2006) or "glare effect" (Zavagno, 1999). 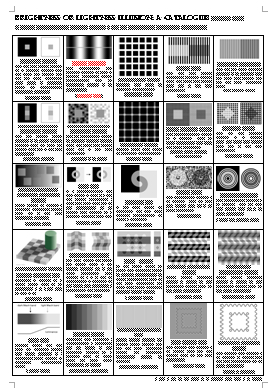 Zavagno, D. (1999) Some new luminance-gradient effects. Perception, 28: 835-838. 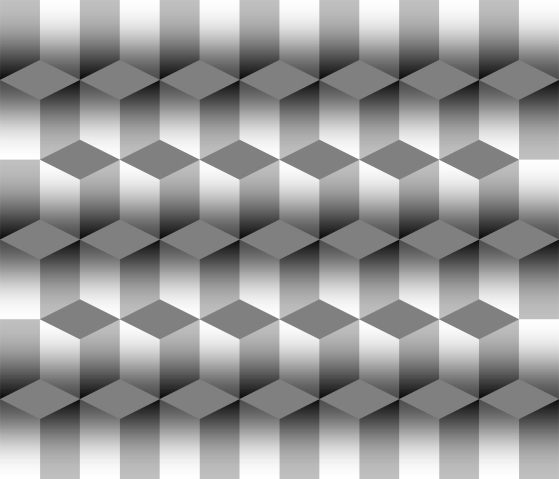 The upper row appears to move upward while the lower row downward. 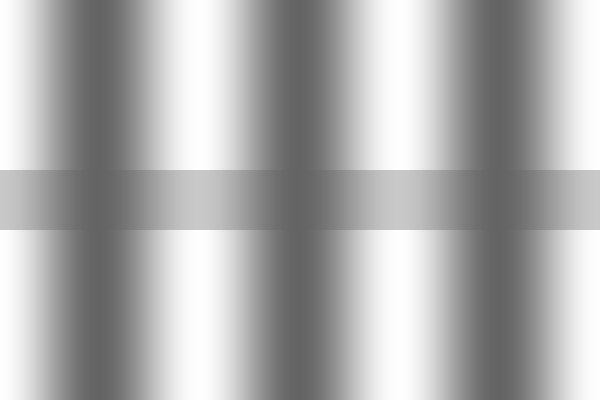 In addition, the gap appears to glare. The visual phantom illusion is a visual completion phenomenon and the basis of the perception of mist or light-shedding. The visual phantom illusion refers to a phenomenon that an illusory grating appears to bridge the occluder that occludes a luminance-modified grating. 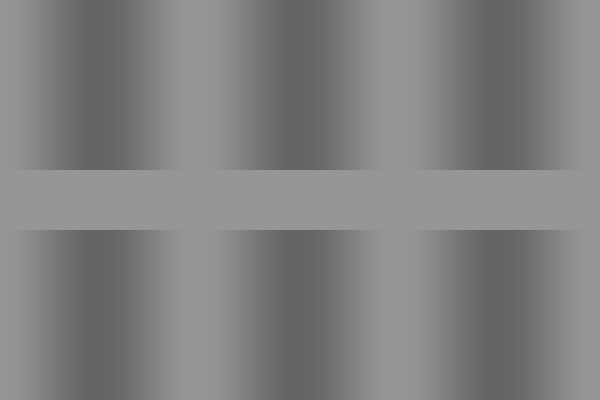 When the luminance of the occluder is the lowest luminance of the grating, dark parts appear to be continual in front of the occluder. Tynan, P. & Sekuler, R. (1975). Moving visual phantoms: A new contour completion effect. Science, 188, 951-952. Genter, C. R. II. & Weisstein, N. (1981). 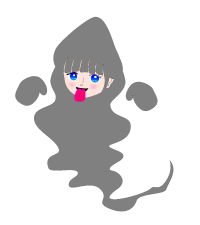 Flickering phantoms: A motion illusion without motion. 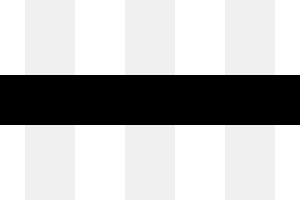 Vision Research, 21, 963-966. 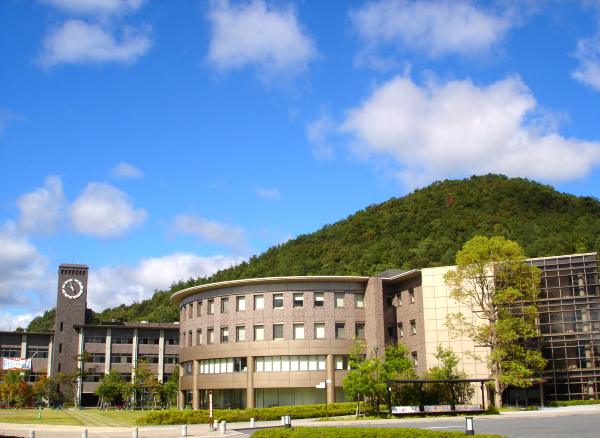 Gyoba, J. (1983). 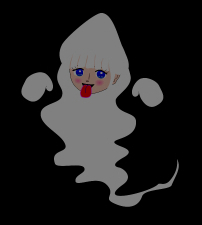 Stationary phantoms: A completion effect without motion and flicker. Vision Research, 23, 205-211. 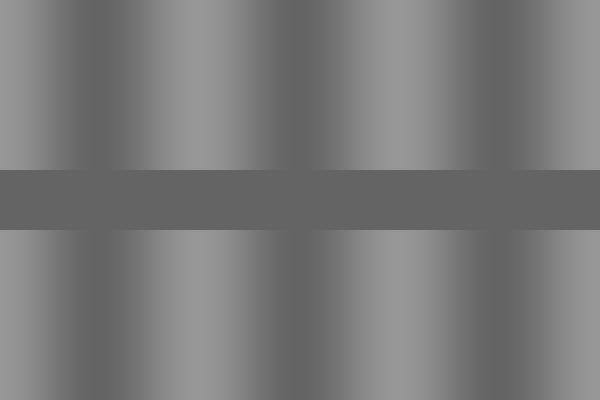 When the luminance of the occluder is the highest luminance of the grating, light parts appear to be continual in front. Sakurai, K. & Gyoba, J. (1985) Optimal occluder luminance for seeing stationary visual phantoms. Vision Research, 25, 1735-1740. 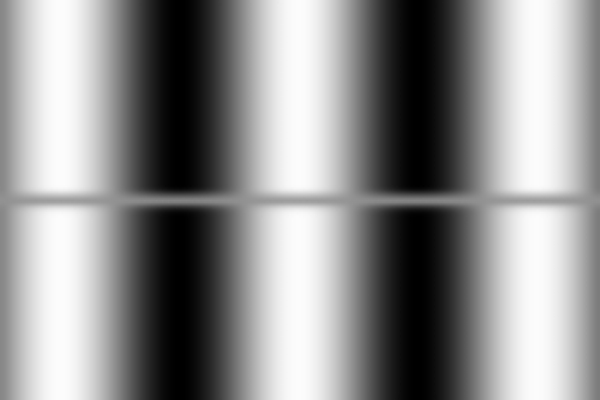 Is the induced brightness in-phase? 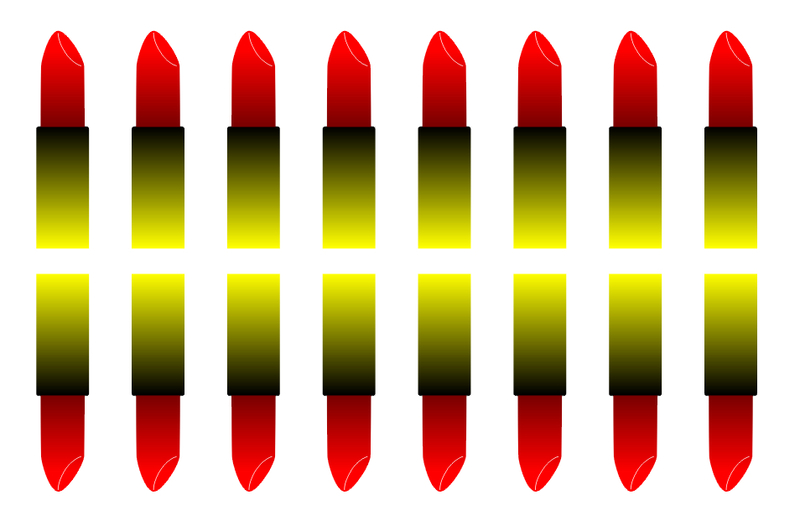 Dark columns appear to be continual in front. This appearance agrees with that of visual phantoms. Is the induced brightness counterphase? Finding: The brightness induction in stationary visual phantoms is not in phase but counterphase, like grating induction. McCourt, M. (1994) Grating induction: A new explanation for stationary phantom gratings. Vision Research, 34, 1609-1617. May, J. G., Brown, J. M. and Roberts, S. (1999) Afterimages, grating induction and illusory phantoms. Vision Research, 39, 3025-3031. 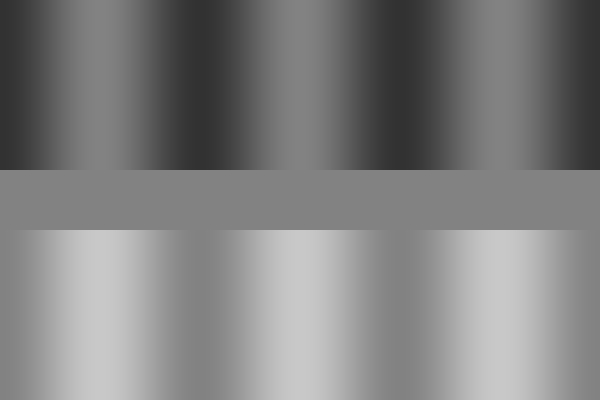 When the luminance of the occluder is placed between the highest and lowest luminances of the grating, strong counterphase brightness induction appears in the occluder and gratings do not appear to be continual. McCourt, M. E. (1982) A spatial frequency dependent grating-induction effect. Vision Research., 22, 119-134. 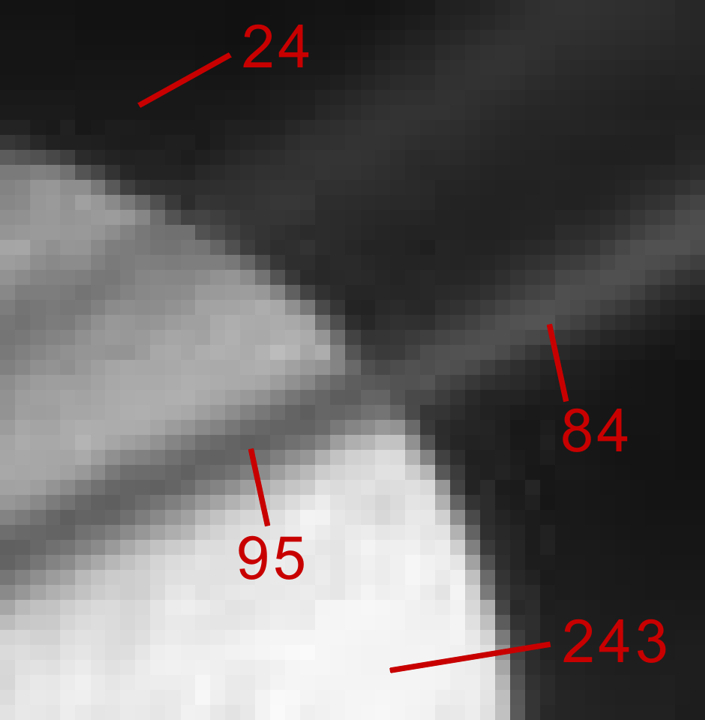 Stationary phantoms are explained in terms of perceptual transparency, in which the surrounding grating induces counterphase lightness induction in the occluder and generates unique transparency that gives the continuation and the fixed depth of phantoms. Kitaoka, A., Gyoba, J., Kawabata, H., and Sakurai, K. (2001). 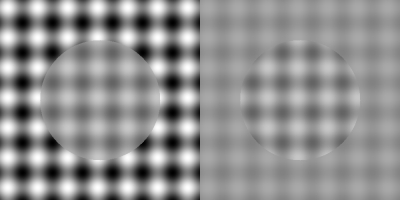 Perceptual continuation and depth in visual phantoms can be explained by perceptual transparency. 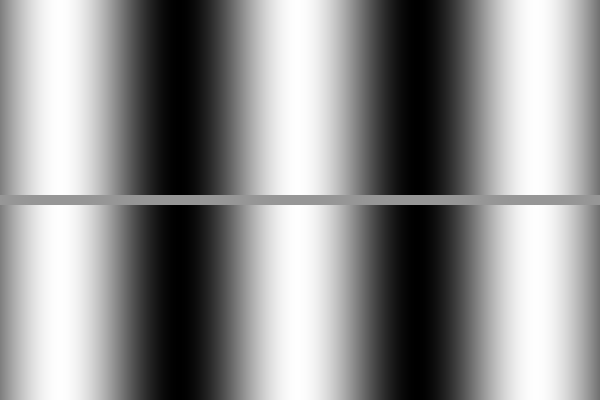 Perception, 30, 959-968. 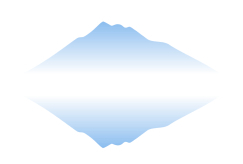 Our claim: The characteristics1) of visual phantoms can be explained with perceptual transparency2) that is cooperatively formed by the inducing gratings and induced ones in the occluder. 1) Phantoms always appear to be continual in front of the occluder. 2) Unique transparency in this case. 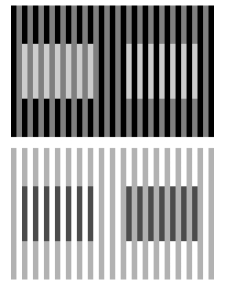 Although it has long been thought that the visual phantom illusion is a phenomenon of visual completion of brightness, mixed phantoms shown below are not paradoxical in our model using perceptual transparency. 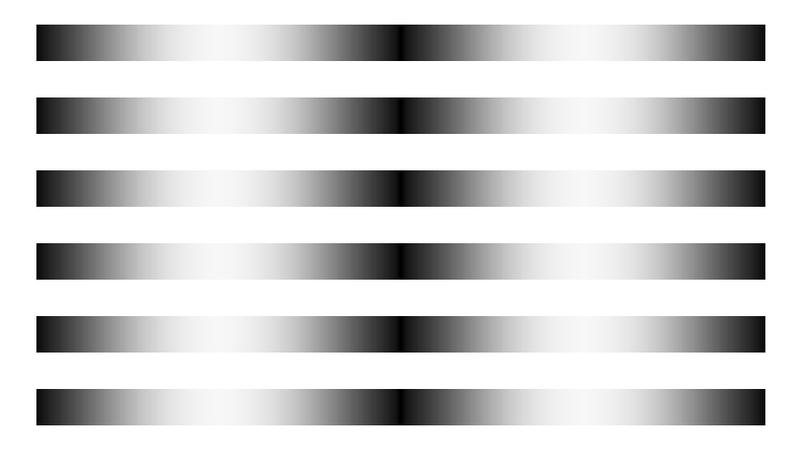 Luminance phases are reversed, but phantoms appear. 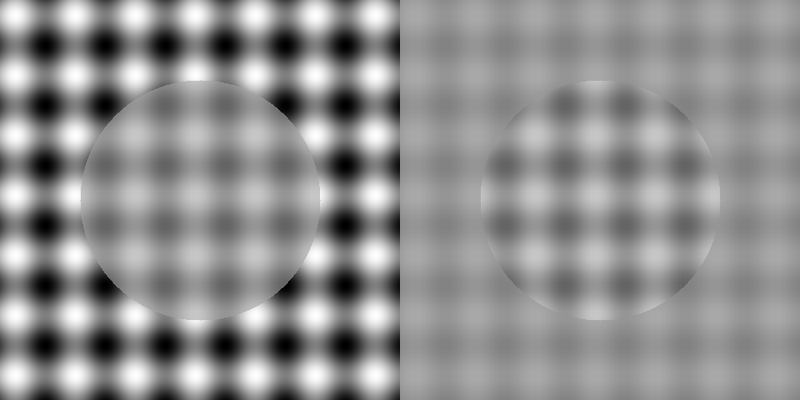 Luminance phases are aligned, but phantoms do not appear. 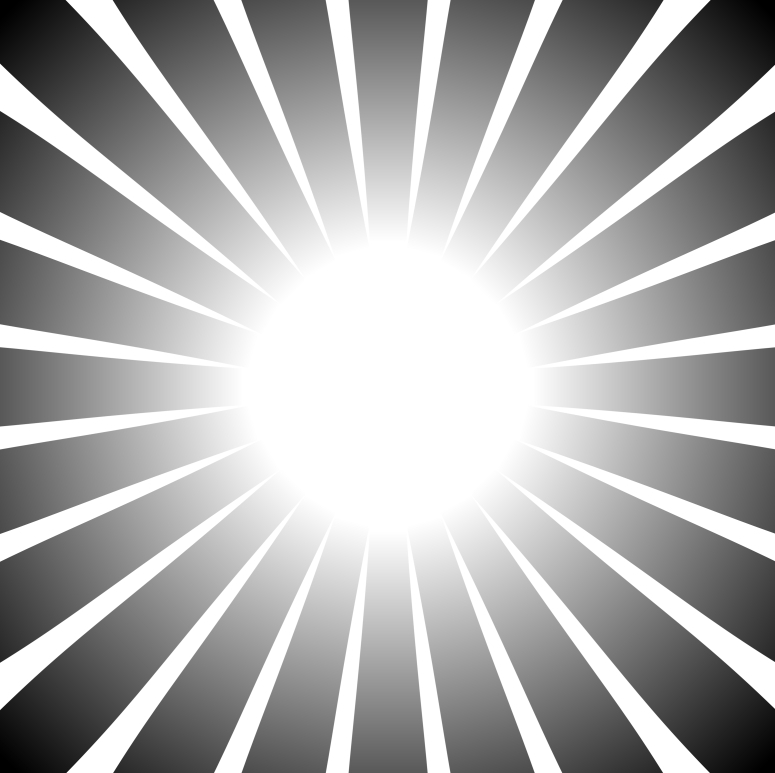 Our claim: Brightness induction is not sufficient to produce visual phantoms. Perceptual transparency is necessary. Phantoms are in-phase with inducing gratings if the presentation time is shorter than about 150 ms.
Our claim: The brightness induction of visual phantoms is the same as that of grating induction. 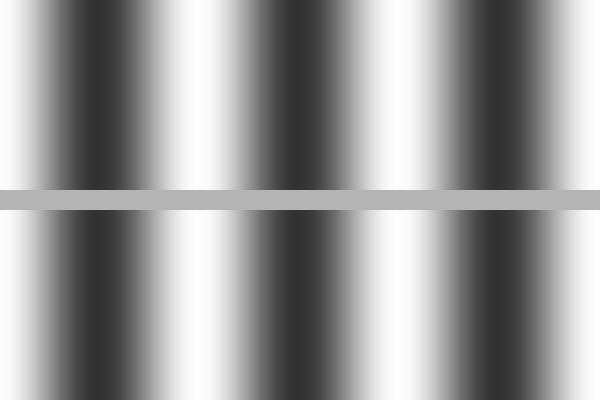 It should be noted that the "occluder" is physically not homogeneous but the luminance grating of the occluder is counterphase with its apparent brightness grating. 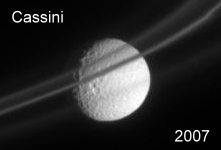 This kind of grating induction is thought to explain the Mimas-and-the-F-ring illusion, which was reported this year. Although gray diamonds are identical, there appear to be light-gray ones and dark-gray ones. 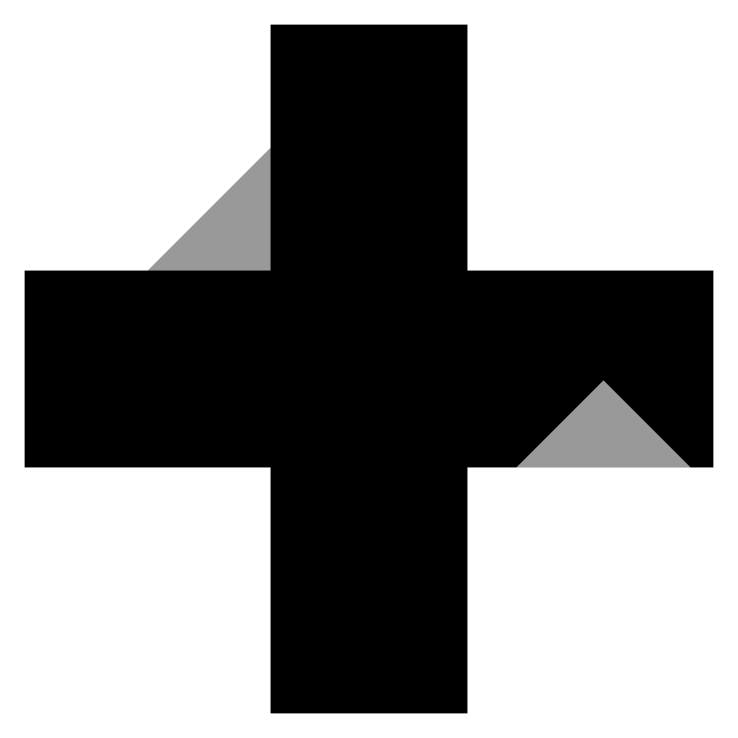 Logvinenko, A. D. (1999) Lightness induction revisited. Perception, 28, 803-816. 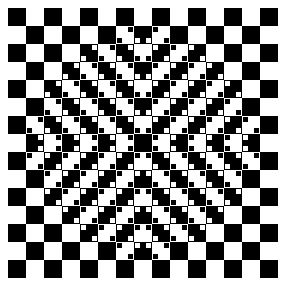 Many brightness illusions have been explained by Mark and Professor Barbara Blakeslee. McCourt, M. E. (2005) Comparing the spatial-frequency response of first-order and second-order lateral visual interactions: Grating induction and contrast-contrast. Perception, 34, 501-510. 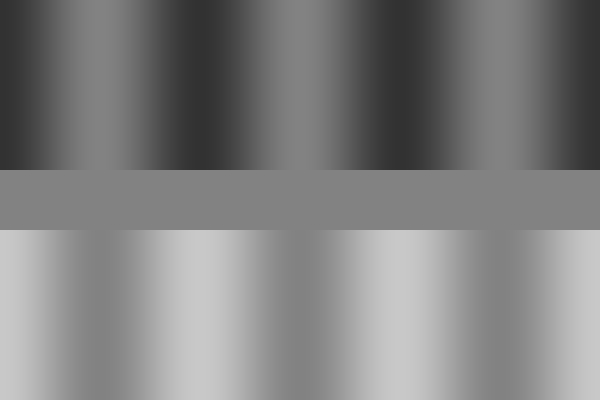 Blakeslee, B. and McCourt, M. E. (2001) A multiscale spatial filtering account of the Wertheimer-Benary effect and the corrugated mondrian. Vision Research, 41, 2487-2502. 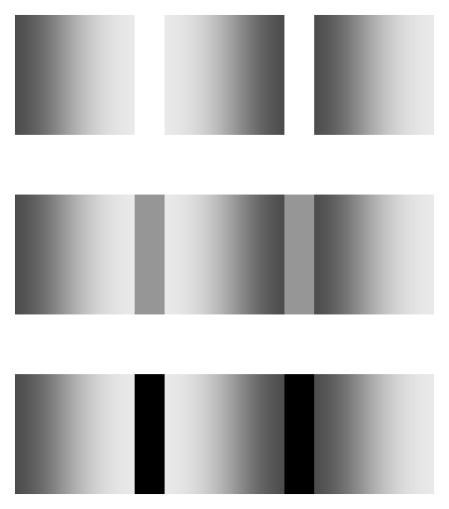 Blakeslee, B. and McCourt, M. E. (1999) A multiscale spatial filtering account of the White effect, simultaneous brightness contrast and grating induction. Vision Research, 39, 4361-4377. 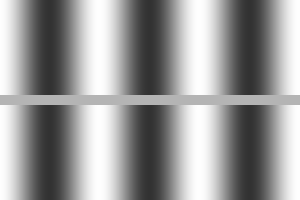 Blakeslee, B. and McCourt M. E. (1997) Similar mechanisms underlie simultaneous brightness contrast and grating induction. Vision Research, 37, 2849-2869,1997. Mark's talk is soon starting!